Are you making any Barleywine? We'll be firing up the brew kettle for Barleywine closer to the fall, so keep an ear to the ground and we'll be sure to let you know! Thanks for writing in. 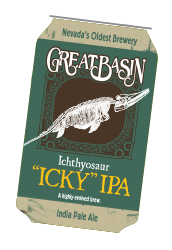 While beer out of a can usually gets a bad rap (c'mon, we've all done it), Great Basin plans to change that with the release of 12-packs of Icky in cans this month. A beer truly worthy of the merits associated with canned beer. Having zero exposure to light, the delicate alpha acids and flavor compounds are protected from spoilage and are preserved perfectly. Also, cans are often able to go where glass bottles fear to tread, they don't shatter, and they're easily portable for that lake or backpacking trip this summer! Look for 12-packs in stores later this month. Remember not that long ago when you spent the month of April in a dedicated relationship with someone called IPA in the hopes of racking up raffle ticket submissions? Well, all of your lip service comes down to this, we'll be announcing the winners tonight at 5pm in Sparks and 5:30pm in Reno. Prizes include kegs, shirts and gift certificates. Winners do not need to be present (unless you want one more taste of our Tectonic Event IPA). 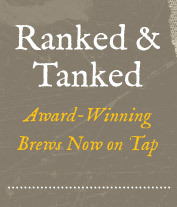 Being a fan of Great Basin Brewing, chances are your mama didn't raise a fool! Celebrate that special lady by bringing her down to Great Basin on Mother's Day (don't forget, that's May 11th) where we'll pour her a free pint of Great Basin beer or wine of her choice with her entree. Cerveza Chilibeso fans will be delighted to know it's back. This three time Great American Beer Festival Gold Medal Winner is a crisp and fresh pilsner style beer with a kick of jalapeno that will have you dancing the Flamenco! It's the perfect complement to the Cinco De Mayo celebration we'll be having at both breweries along with our Mexican-themed food specials. For you gringos, that's May 5th! 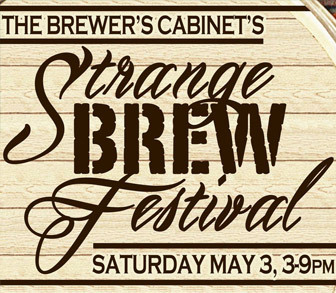 Great Basin will be in attendance this Saturday, May 3rd at the first Strange Brew Fest hosted by The Brewer's Cabinet. Tickets are $30 pre-sale and $40 the day of the event. There will be BBQ and Live Music to accompany brews being poured from 3pm - 9pm by The Brewer's Cabinet, Great Basin, Silver Peak, Under the Rose, BJ's, Brewing Lair and Brasserie St. James (take off eh, no Elsinore Brewery here). A daunting 4,754 beers and 58 countries competed at the 2014 World Beer Cup® this year, vying to be recognized for brewing excellence and as master in a craft that grows every day. Great Basin's own Outlaw Milk Stout was a standout, taking the Silver Award in the Sweet Stouts category for an amazing third time since its first entry in 2008 at this prestigious event. Since 2002, Great Basin has won 7 World Beer Cup awards and is proud to be serving world-class brews to craft beer fans in Nevada and California! A hometown favorite and Silver medal winner at the 2013 Great American Beer Festival in the Fruit Beer with Wheat category. Bitchin' Berry will be released tomorrow in our brewpubs as a Summer seasonal brew. Look for it in 4-packs as early as Monday in your favorite beer store. Both the Reno and Sparks locations have opened up seating on the outdoor patios. Get outdoors and drink your beer like nature intended. A food and art event. At McKinley park near the River and Keystone in Reno.